Touch is the new black. No, make that “œMulti-touch, is the new black” when it comes to smartphones. This year, Reasearch In Motion released their new line of multi-touch smartphones that will carry the latest BlackBerry 7 Operating System. Back in the spotlight is the BlackBerry Bold 9900. 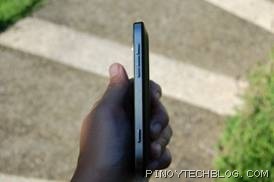 Looking at the Bold 9900, I can pretty much describe it in one word. Classic. True to it’s name, the 9900 exudes a classic BlackBerry Bold design. If you’ve been a CrackBerry (BlackBerry addict), a fan, or a BlackBerry user for quite sometime now, you will probably agree with me. Yes? 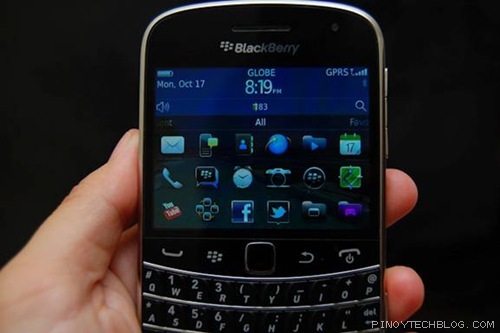 Looking a lot like the 2008 Bold model (Bold 9000), but this time, with a thinner, sleeker, bolder look. The sleeker, bolder appearance comes from a real brushed metal finish that surrounds the unit. 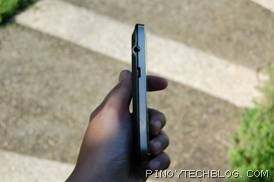 It is the thinnest BlackBerry to date at just 10.5mm (that’s 0.41in). RIM brought back the wide-body design with a fantastic physical keyboard that makes the typing experience so perfect and efficient, you wouldn’t mind composing long emails when using this phone. The keys are definitely bigger and softer to press which makes it easier and hassle-free for the user when composing emails, texts, tweets, and BBMs. Just above the (excellent) keyboard, are the traditional Blackberry keys plus the the trackpad. 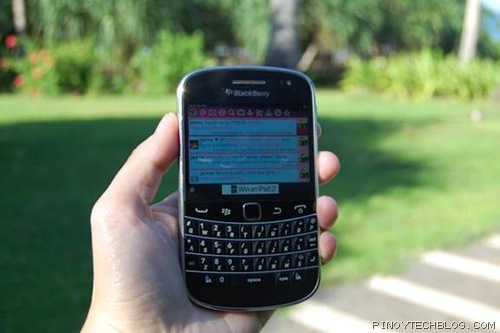 Again, if you’re a “œCrackBerry”, you will easily spot that the Send and End keys have lost their green and red colors. 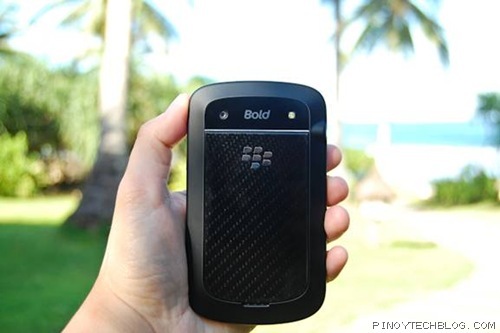 The Bold 9900 has a 2.8-inch high-resolution, multi-touch display, with a 640Ã—480 pixel resolution at 287ppi. 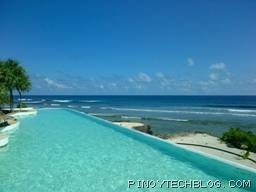 Overall, the display produces vivid colors and thanks to RIM’s implementation of “œLiquid Graphics”, browsing and navigation has been much smoother and efficient. Yes, I’ve tried the “œpinch-in and pinch-out” zoom gestures and I didn’t get disappointed with the experience. RIM did a really good job on improving their multi-touch functionality on this phone. At the right-side of the phone, you will find the standard volume/media buttons (also made of metal) and the mute key, now situated in the middle. Another subtle but acceptable change from the older models where you’ll find the mute key at the top of the phone, together with the lock key. The convenience key (programmable) is still situated at the botton-right of the unit. On the other side, you will find the 3.5mm audio jack and the microUSB port. The lock/unlock button is still located at the top. The rest of the back-part is made of rubber that will surely help in having a firm grip. The battery cover has a carbon fiber look to it and you will find the 5 megapixel camera with LED flash also at the back of the phone. This phone is really fast. Yes, it is the fastest BlackBerry I’ve ever used. Thanks to the QC 8655 1.2GHz processor and the 768MB RAM, opening and loading of applications was instant. Seriously, I didn’t even see the “œdreaded hourglass” during my review of the unit. It was that fast and responsive. 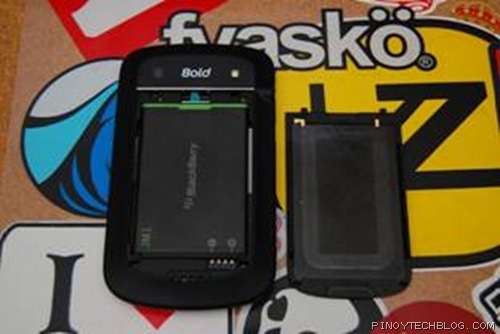 No improvements on the battery life for the Bold 9900. I’ve always wished that RIM would come up with a better and long-lasting battery for the new BlackBerry models. The battery life was not that bad though considering it has a multi-touch feature and a fully charged battery can last a full day. 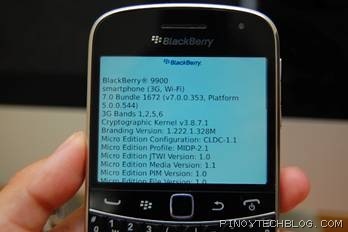 RIM not only thought of improving the Bold 9900’s hardware. Clearly, they made sure to pair the powerful set of processors and memory with a new and improved operating system, the BlackBerry 7 OS. Graphics and browsing: BlackBerry 7 features the fastest BlackBerry Browser to date. Navigating and loading of pages was seamless, smooth and really fast. Voice search: Who needs a speech-to-text translation when you already have an excellent keyboard? Well, I would consider this as an added feature and probably useful when you’re driving. 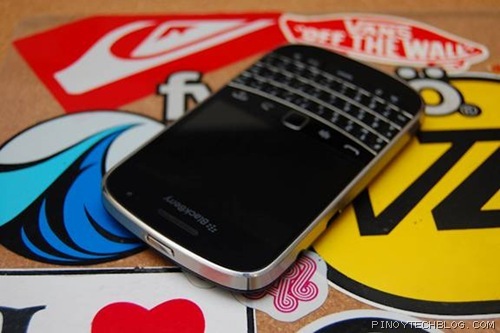 You can now search for files, contacts, or anything that’s stored in your Bold 9900 without typing a thing. Awesome! Camera/ HD video: Finally! A BlackBerry that records full HD videos with a 1280 x 720 resolution. It’s not the best video recording gadget but the output is pretty impressive. It also features a 5 megapixel camera with LED flash that produces great shots. 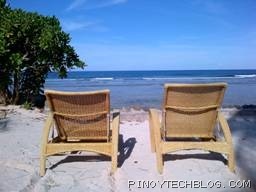 Here are some snapshots I took during my vacation in Calicoan. Near Field Communication: The Bold 9900 has NFC support . 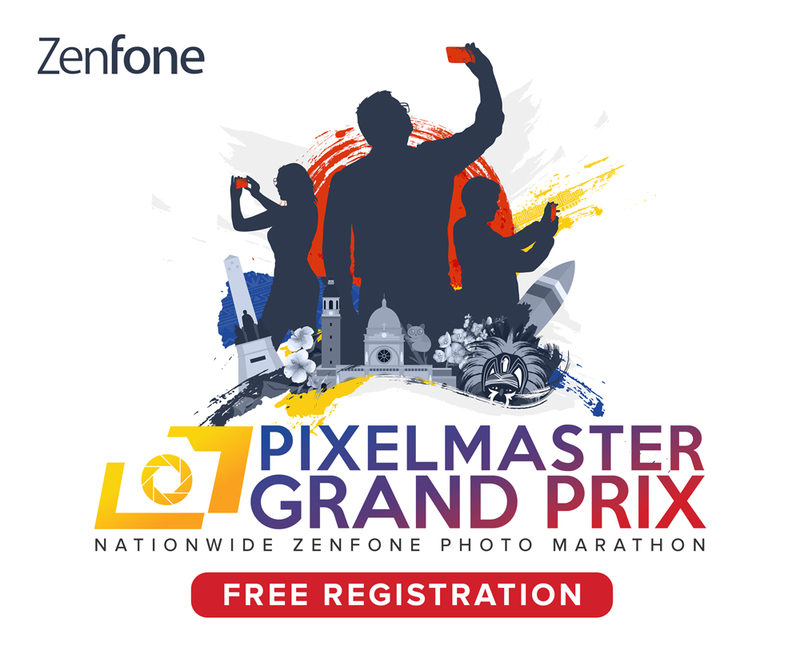 Come to think of it, it’s not yet fully established or usable especially here in our country but it’s an emerging standard (a way of transmitting data) so this is an added feature that is something to look forward to. Don’t go comparing it to iPhone and Android units. The Bold 9900 is an exceptional smartphone built for productivity and communication. With both hardware and software upgrades, it’s “œThe best BlackBerry” I’ve used so far!